Last February, Craig Venter gave a talk at TED about how we are "on the verge of creating synthetic life." He compares the building of an organism to building a computer systems: "digitizing the genome", "software builds its own hardware" and "booting up the new cell." Mac flipped through slides indicating that "backyard biology" is alive and well. One illustrated guide found online describes how to isolate DNA using chemicals found in every kitchen cupboard. Need more DNA? A $10 PCR device assembled from basic parts might do the trick. And a recipe from the pages of MAKE magazine provides the know-how for armchair anthropologists to combine a few legos, a source of current, and a cheap enzyme kit to generate DNA fingerprints. While backyard biology promises to be an avenue for individuals to flex their intellectual muscles and explore the molecular world around them, Jason Bobe argued that the possible impacts of a DIY world go well beyond that. Amateurs and hobbyists are making significant contributions to engineering, environmental sensing, and even medical devices. The group gathers online at the DIYbio Google Group, and they've started to share links on del.icio.us (tagged DIYbio). Those are potentially great resources for the at-home biohacker. We're talking about the government pressure on doing activities that are perfectly legal. We're talking about activities that at one time in this country were considered a great idea, like amateur science. Say someone wants to have a laboratory in their house. I guess not a lot of people have that any more, so that's weird. And because it's weird, it's suspicious. And because it's suspicious, we have to think it's probably terrorism. So if you do plan to do some biohacking, you might just have to build yourself a secret laboratory. 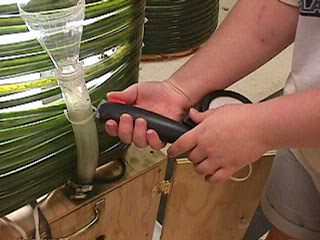 Image: An early version of a homemade photosynthetic bioreactor "biocoil", created by advanced biology students at Cascade High School in Cascade, Idaho.